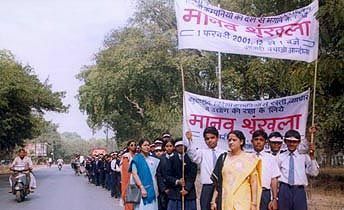 More than 3.5 lac boys and girls belonging to schools and colleges, led by their Principals and teachers, staged the biggest ever demonstration against globalisation and consumerism under the auspices of Azadi Bachao Andolan (ABA) on the 1st of February, 2001. Together, they formed a human chain 300 kms long, linking Allahabad to Varanasi, Varanasi to Jaunpur, and Jaunpur to Allahabad in the Hindi heartland of India. Pepsi bottling plant at Satharia on Allahabad-Jaunpur highway and the Coca-Cola bottling plant at Rajatalab on Allahabad-Varanasi highway, that were encircled by the chain, symbolised globalisation and consumerism for them. The event followed more than one and a half years of intensive work by ABA activists and school teachers in educating the youth about the health hazards of carbonated, acidified cold drinks, and the consumer movements against them. The local popultion was educated about the ill-effects of globalisaton on agriculture and employment opportunities. The response of the youth to join the chain was tremendous. At Pawara, on Allahabad-Jaunpur section, 27 schools had assembled - making it a festive sight. Hori Rao Inter College at Kuwanpur reported cent per cent attandance, led by the Principal and the staff. More than a thousand youth of Chandrashekhar High School had cycled 10-15 kilometres to join the chain at Sahson. And youth still further at Mauaima took transport to join. The youth in the school for deaf and dumb were no less enthusiastic in Jaunpur-Varanasi sector. On Allahabad-Varanasi sector, three links had to be made to accommodate the numbers at Samadganj, Fatehganj and Handia. At the Coca-Cola bottling plant at Rajatalab, the gathering of the youth against the Company was so thick and agitated against the Company that the ABA activists in mobile vans and retired army personnel had to work hard in keeping them in control. There were no posters nor banners in the region to announce the event. It explains the extreme paucity of funds with ABA on one hand, and spontaneity of the masses to associate itself with the cause that affects its life and livelihood. Dozens of schools that joined could not be reached before by ABA activists even once, proving that the issue of globalisation is well recognised by the masses - at least by schools. The event proved that the barriers of cast, creed or even economic inequality melts out, if genuine issues are taken up without ambitions of power-politics. 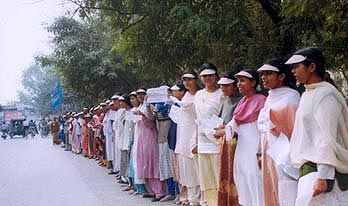 The school youth in Azadi Bachao Andolan’s cap, that had become a part of their common uniform proclaimed their resolution of freeing India from Corporate Colonialism. As they joined and formed the chain, the slogans: "Pepsi-Coke Quit India", "MNCs Quit India", :Corporate Colonialism - Down - Down", filled the air on this vast route. It was remarkable that the chain was joined by government-aided schools and public schools with the same vigour. The youth coming from affluent families admitted they were taking Pepsi and Coke before, but resolved to boycott it. The large dimension of the chain and the great numbers involved had its problems too. If there was overcrowding at a number of places, there were gaps too at a dozen places, measuring a furlong long at one place, and even 4-5 furlong long at another. As the chain was not stretched one, few reporters estimated the number nearing five lac. ABA believes that the only way the farmers, the small industries, and public sector workers being uprooted by the globalisation can fight back is by throwing out MNCs working in their respective areas. That is why, the bank employees, union workers of LIC and Post and Telegraph also joined the chain at ABA’s invitation. The grass root activists and ABA’s activists from Karnataka, Tamilnadu, Rajasthan, Madhya Pradesh, Bihar, Bengal, Haryana and Delhi joined the event and participated in the two-day National Convention of ABA on 2nd and 3rd February, 2001. Letters were handed over to the Plant Managers at Pepsi/Coke demanding them to shut and quit.